Marimo moss balls are a unique species of algae that form into spherical shapes. They grow most commonly in the lakes of Japan – where they are revered and considered a national treasure – as well as in Scotland, Estonia and Iceland. In 1898, a Japanese botanist termed the algae marimo. The first part of the word, mari, means bouncing ball. The second part, mo, is used to describe plants that grow in water. There are three types of marimo, or Aegagropila linnaei, growth forms. The first type, epilithic, grows on the shaded side of rocks. The second are free-floating filaments, which are small clusters of algae that settle at the bottom of lakes forming a muddy carpet. 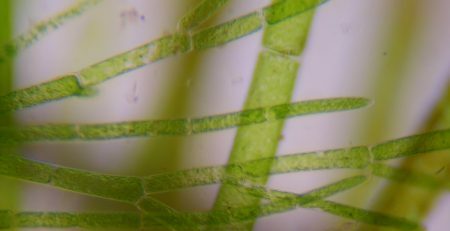 The third type is the algae that forms into the beautiful spherical shapes made up of many filaments. 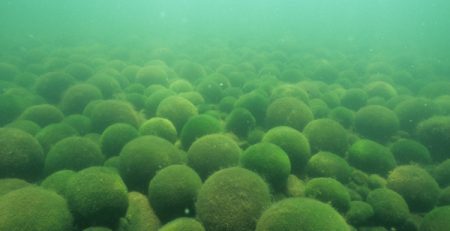 The size and abundance of naturally occurring marimo depends on the underwater light conditions combined with wind currents, sedimentation, lake morphology and the lake bottom. Gentle waves turn the algae giving the marimo moss balls a spherical shape. The green color allows the algae to photosynthesize regardless of which side faces the light. In large collections, the waves tumble the balls so that all reach the light. Marimo grows annually at about a rate of 5 millimeters. Although they marimo moss balls seem like large balls of seaweed, they exhibit some interesting behavior. They rise, sink, roll around and dump sediment that collects on their surface. They also rotate positions with other marimo balls in a collection. They are often mistaken for marine creatures because of their movement, causing some people to consider them sentient beings. 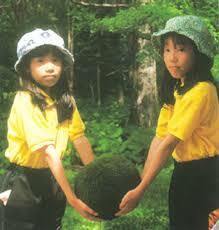 Large marimo moss ball collections can be created artificially. These collections are very popular in Japan. 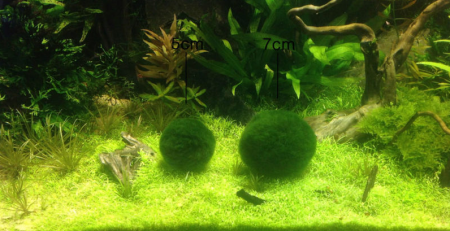 There are several differences, between natural and artificial marimo. If marimo balls are split in the middle, the artificial kind will have no pattern. The filaments resemble tangled spaghetti. The natural kind will show a radial pattern. Artificial marimo can grow in room temperature tap water, but the water must be changed weekly or bi-weekly. The water will need to be changed more frequently in the summer and less often in the winter. Although marimos can be placed in the refrigerator if outside temperatures are very hot, they should not be frozen. Photosynthesis can occur under artificial conditions with normal household lights. Marimos are used to low-light conditions so indirect sunlight works as well. It may sound strange, but immersing the balls in club soda increases the photosynthesis rate. The carbon dioxide in the soda helps algae growth, but is harmful to fish and other marine creatures. Should the marimo moss balls turn brown, add some salt to return their beautiful lush green color. 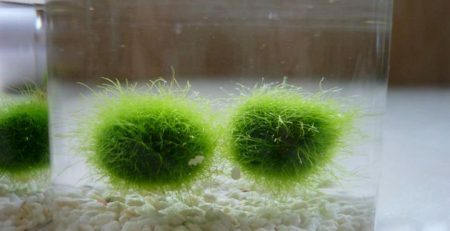 Artificial marimo moss balls will be slower to grow in an aquarium because the water current isn’t as fast as in a naturally occurring body of water. So if you want to cultivate a large marimo moss ball collection, you will need to be a bit proactive. 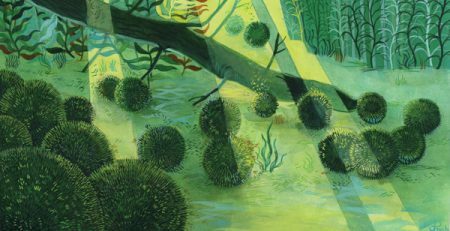 To combat this slower growth, the balls can be taken apart to expose the individual algae strings to light. They will rejuvenate within four to six hours. Then they will need to be rolled back into their ball form. This will take a lot of patience and some gentle handiwork. For those that have neither, the new ball can be placed into a round container with circulating water. Marimo moss balls are great as aquatic plants because they control the growth of algae since they outpace other species. They are almost like organic filters that clean out the tank’s water. 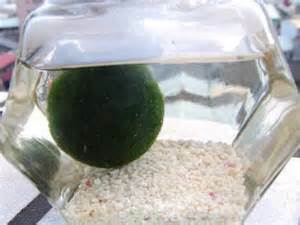 Marimo are also easy to cultivate, requiring very little space and care. All fish can survive with marimo, and algae eaters stay away because the balls are very tough and difficult to eat. So creating a large marimo moss ball collection is as easy as purchasing the algae, placing it in a tank and watching it grow. They also have long life spans, with the oldest known marimo ball living for more than 100 years.